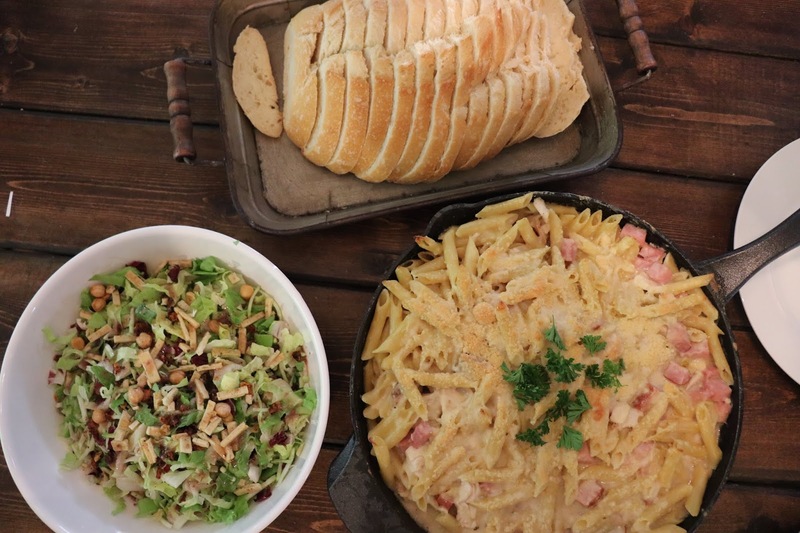 My kids LOVE chicken cordon bleu and so when I had rotisserie chicken on hand last week I decided to give this recipe a try and it was SO SO SO GOOD!!! Step 1 - Preheat the oven to 400 degrees and in a large pot of salted boiling water, cook pasta according to the package directions until al dente. Drain and set aside. Step 2 - In a large skillet (on medium heat) melt the butter and add the garlic and cook about 2 minutes. Sprinkle in the flour and cook until slightly golden (about 2 minutes more). Pour in the chicken broth and heavy cream and bring to a boil. Season the mixture with salt and pepper, add mustard powder and then reduce the head to medium-low and simmer until the liquid coats the back of a spoon (about 10 - 12 minutes). Confession - I didn't know what it meant when it said "until it coats the back of a spoon" so I had to google it. Essentially, if you run a wooden spoon through the mixture, pull it out and run your finger across it to make a line the liquid should be thick enough to not run through the line. If it runs through it that means you need to cook it a little bit longer. Step 3 - Remove the skillet from the heat and stir in the cooked pasta, shredded chicken, ham and Gruyere. Sprinkle the top with Parmesan. Step 4 - Bake the entire dish until warmed through, about 15 minutes. I broiled mine for a few minutes after to get the top extra golden. Y'all - this was AMAZING! I know that it looks a little bit complicated, but it actually came together really quick. I prepped the ham and chicken on Monday night (I made this on Wednesday) which made putting it all together extra simple. I'm always looking for a meal that I can serve to friends on a night when I've been at work all day and this would be one since I could prep the chicken and ham (and really even the penne) ahead of time. I served mine with sliced bread and a salad kit from Trader Joes and everyone in my family gobbled it up and the boys even requested leftovers in their thermoses the next day (which I know means they really really loved it). If you try this one I'd love to know what you think! And don't forget that you can check out the rest of my recipes by clicking HERE. I have a confession... I’m 39 years old and I’ve never tried chicken cordon bleu! Clearly I need to remedy that ASAP and make this pasta!! Yum! Thank you for another awesome recipe! Just so you know...you totally made gravy!! Gravy is basically the butter, flour, liquid mixture you made for the beginning step of the recipe. I knew you could do it!!!! Love it! Looks delish and innovative! I haven't seen this before. I'd love it if my kids ate "big kid" food like this. I still deconstruct things for them and would love to serve up bowls of yum like this. What type of bread did you serve?